US releases "sizeable tranche" of documents recovered from al Qaeda leader. The U.S. government today released dozens of documents recovered from the special operations raid that killed al Qaeda leader Osama bin Laden, including now declassified correspondences from bin Laden and 39-English language books in which the terror leader apparently took interest. The material includes think tank reports, software and technical manuals for computer programs, and Arabic-language letters to bin Laden’s apparent associates, including other suspected terrorists wanted by the U.S. In releasing the documents, the ODNI said they are only publishing those which “will not hurt ongoing operations against al-Qa‘ida [al Qaeda] or their affiliates.” For documents in Arabic, the ODNI posted English translations of the documents alongside the originals. So Who Actually Killed Osama Bin Laden? In the case when such operations failed, bin Laden took note of how and why in another document in which it is noted how the aspiring bombers were caught or killed. Azmarai goes on to advise the recipient to only change houses on cloudy days – possibly to avoid detection by overhead surveillance. In one letter, bin Laden appeared to cheer on the Arab Spring as it was erupted across the Middle East and north Africa. The movement began in late 2010 and continued through 2011 -- well past bin Laden's death in May of that year. “We should also be gentle and compassionate toward those who were misguided for many decades,” he writes. Former CIA Deputy Director Michael Morrell recently wrote in a new book that the CIA badly underestimated al Qaeda’s ability to take advantage of the chaos and power vacuum caused by the Arab Spring. Portions of the bin Laden document trove have previously been released, once by the Combating Terrorism Center at West Point and once through a terror trial in New York. When bin Laden was killed in May 2011, officials described recovering a “treasure trove” of material on al Qaeda from its late leader. Think tank reports from groups like West Point’s Combating Terrorism Center, Chatham House and the Jamestown Foundation were also discovered – almost all apparently focusing on terrorism. Religious texts include a copy of the Koran and other Islamic texts, but also “Profiles of bishops in the Church of England.” A few maps recovered from the compound show bin Laden had an apparent interest in Iran, especially Iranian nuclear sites. 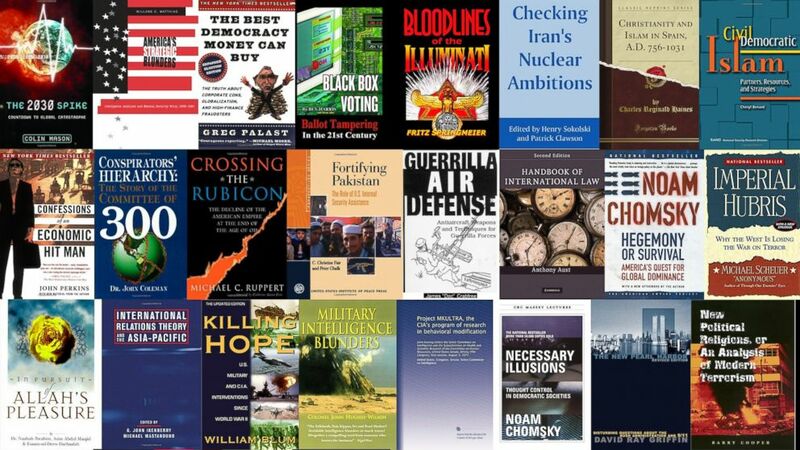 Among the books recovered from the Abbottabad compound were non-fiction works about the CIA, terrorism and U.S. military history and politics, including Bob Woodward’s “Obama’s Wars”. Bin Laden appeared to read what Western analysts thought about al Qaeda and some conspiracy theory-themed works about 9/11. In the mid-2000s Bin Laden was also apparently a reader of Western current events magazines such as Foreign Policy and Newsweek, especially when cover articles focused on al Qaeda and America’s response. ( ) On May 20, 2015, the Office of the Director of National Intelligence released a list of 39 English-language books recovered during the raid that killed Osama bin Ladin. ABC News' Cindy Smith, James Gordon Meek, Justin Fishel, Mustafa Hameed and Sarah Kolinovsky contributed to this report.